07/04/2001 : Of the whole Danish squad that made the trip to Tokyo, there will be only one men’s doubles pair left today in the Japan Open semi finals. And many players answered with a grin, hoping for few days of rest, with many of them either injured or ill. But this might be a necessity when looking at the results of the team. Only Lars Paaske and Martin Lundgaard Hansen are in the semi-finals of the event. One must look back pretty far in the statistics to see such a lack of results in a 5 star tournament for the Danes. “I think there is something wrong with the Danish team nowadays. They obviously need some physical work out and better sparring partners,” said a Danish TV reporter who is very close to the Danish squad and following Camilla Martin and Peter Gade for a special feature portrait. “The men’s doubles is the only event which still holds up, because there is always someone to look up to. Lately, Sogaard and Laugesen have had very good results, and today, Lars Paaske and Martin Lundgaard Hansen did really well. But in the other events, it is rather critical. The women’s doubles is a mess, they lose confidence one tournament after the other because none of them win, and in the singles, everyone relies too much on Peter Gade and Camilla Martin. When they’re gone, no-one is there to take their place, as there is a big gap between the promising young players and the elite in the country”. On court today, Peter Gade’s defeat was the biggest surprise of the day. He did, however, play well, but missed energy at key moments. His attacking game had improved since the All England, but his speed wasn’t just enough to outplay. The 21 year old Chinese was imperial throughout the match, using his powerful straight smashes to score one point after the other. It looked as if Gade had to be playing at his very best to beat Chen, but he played just good enough to win one set. Once the players were almost even in the third set, Chen was able to find incredible energy to speed up the game. Trailing 4/7, he accelerated at such a pace that the Dane – who is known to be one of the fastest shuttlers in the world – couldn’t follow, to win 15/7. “It is the first time I beat him in three meetings, and I am very satisfied. I knew that I had to speed up the pace in the last game if I wanted to win, and I am glad I could do it” said Chen, who should prepare for another tough fight in today’s semi-final as he faces Lee of Korea. Anders Boesen logically lost to Roslin Hashim while Shon Seugn Mo of Korea beat Colin Haughton. 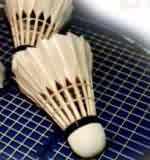 The English National champion had to retire in the second game after being led 4/15 – 1/7 because of a back injury. In the women’s singles event, Ekmongkolpaisarn of Thailand and Gong Ruina played the longest match of the day, over 1h45 minutes and three incredible games. The Thai, who had been resting and practising hard since the Olympics was eager to do well and almost created a big upset. Ranked 102 in the world because she hadn’t played for few months, the Thai girl realised that she missed experience at a high level. “I think I could have won if I had played one or two other tournament before this one, but our team needed a good rest after Sydney, and we wanted to do our big comeback for this Japan Open”. Using a very wide variety of strokes, competing in every field of the game with Gong, Ekmongkolpaisarn made the Chinese doubt herself many times, but eventually lost on one of her only unforced errors on a service return, 11/13 – 13/10 – 9/11. As expected, Zhang Ning won her ticket to the semi finals, and Zhou Mi didn’t spend much more time against Mette Sorensen, the last Danish player to play in the women’s singles. But the unexpected guest at this stage is young Kaori Mori of Japan. The local hero was facing Wang Chen of Hong Kong for the first time. “I had taken a video home to watch her play as I didn’t now her at all, but my VCR broke down, so I didn’t know what to expect at all,” laughed Mori in a press conference where all journalists were delighted by such a victory. “Then my coach said to just play long rallies and force her to make mistakes”. It proved effective, when Chen made a big number of unforced errors in the last game, losing 11/1. “I intend to play the same type of game against Zhou Mi” said Mori. In the doubles, the Danish black day wasn’t over, after their three singles players were out. Only Paaske and Lundgaard Hansen had a good victory over Chinese Liu and Chen. Jens Eriksen and Jesper Larsen couldn’t find the right pace to compete against Indonesians Gunawan and Heryanto, and the new world number one pair lost 15/11 – 15/9. The other semi-final will feature a promising match between Chew/Chan of Malaysia and former world champions Budiarto and Wijaya. Not much luck for Eriksen in the mixed doubles, as he and partner Mette Schjoldager completely missed their second and third games against Suprianto and Timur. Playing way below par, the Danes gave away the match by committing many errors, especially from Eriksen who found himself unable to return well and who missed many easy smashes, probably due to his back problems. Indonesia’s good tournament could then continue, with a second winning pair in the mixed doubles semi-final, Widhianto and Marissa who will meet Liu and Cheng, while Suprianto and Timur will play Zhang/Gao, the Olympic champions. China rules the women’s doubles as usual, with three pairs in the last four, the remaining one is from Chinese Taipei, as Chien and Cheng beat a good Thai pair in the quarter finals.